Black ceilings sound like they’d be cold and dreary, but I’ve been coming across spaces with black ceilings that are anything but. Painting the ceiling dark creates a clean, bold contrast that when paired with layers of warm texture makes a room sophisticated and intimate. Here are five spaces transformed by bold black ceilings. 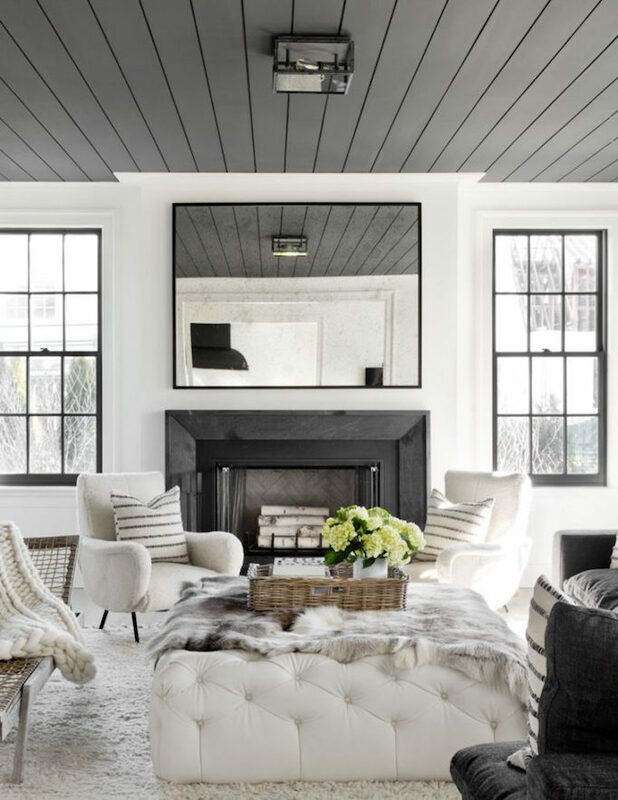 A black and white space made warm with the painted shiplap ceiling and layers of knits and furs feel refined and cozy at the same time. Here the painted black ceiling evens out the heavy beams in this industrial loft and balances the black accents used throughout the design. This coastal home still feels light and airy even with the painted black ceiling. The dark above grounds the space and ensures that the high ceilings don’t feel cold and imposing. 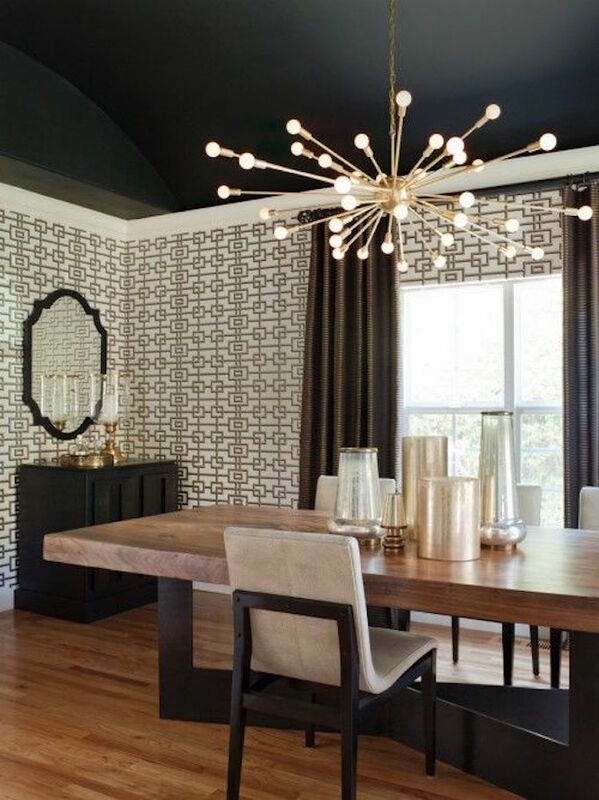 The black ceiling in this beautiful mid-century dining room adds drama with the brass accents popping in contrast. Black vaulted ceilings are fresh in this farmhouse when paired with crisp white, brass pulls, and a beautiful warm rug. Dark dramatic ceilings create surprisingly fresh, cozy spaces. If you are loving the look, also check out these bold black bathrooms and my black paint guide. Have a happy Wednesday! Black is bold. Black is crisp. And black is beautiful. It’s one of my favorite colors to design with and a trend in design that is both old and new. Here are 8 examples of bathrooms where black is used as a primary color to create rich spaces with classic refinement and a modern edge. The high gloss black paint in this space frames the bathroom with a polished, rich look. Gorgeous!! A great example of classic style with a modern edge. The painted black cabinetry in this bathroom makes the space. A black, painted brick wall creates a fresh new look in this bohemian bathroom with global style. I love the use of a shiny black freestanding tub in this space. It’s a beautiful bathroom with the elegance of an old plantation, yet infused with modern elements. A bright and clean combination. Classic beauty. The black wood doors and brass knobs are a gorgeous pairing with the warmth of oak wood flooring, white walls and the design of the mediterranean tile. This bathroom is so modern and crisp. I love the fresh geometric wallpaper. 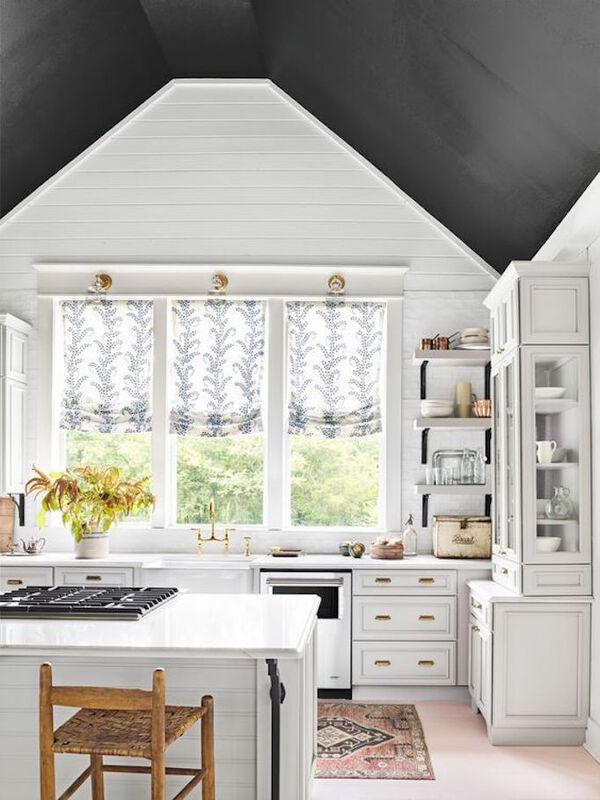 Consider black painted shiplap. It’s a modern take on a classic look, creating a unique space. Both of these spaces are great examples of bathrooms with floating vanities in black tones. I love the black all stone walls of the vanity on the left and the black drawers surrounding the sink on the right. With all this amazing black bathroom inspiration, the only thing left is a guide for black paint. The colors below will work beautifully on walls, cabinetry, doors and trim to create bold and unique spaces. I hope you have enjoyed today’s color inspiration. For more of my favorite cabinetry paint colors visit here. Have a great day!